So T turned 5 this past week and she is currently obsessed with the cartoon Avatar: The Last Airbender, particularly the little girl Katara who is a waterbender. I made up this fun costume for her and she adores it. 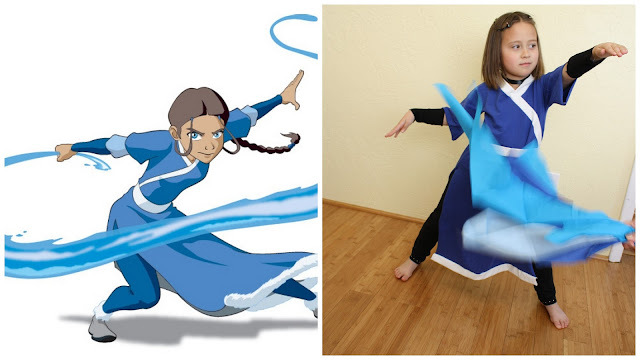 Her little eyes just lit up when she saw it finished the little avatar waterbender costume. We had a lot of fun taking pictures with my mom and the musicmaker waving fabric for water. She practices her waterbending skills all the time and is hysterically serious about it. So of course we had to have a waterbender party for her. And since I’ll take any excuse to make costumes and dress up we were the whole Avatar crew for the day of her birthday party. Isn’t the musicmaker the best uncle ever? I love this! 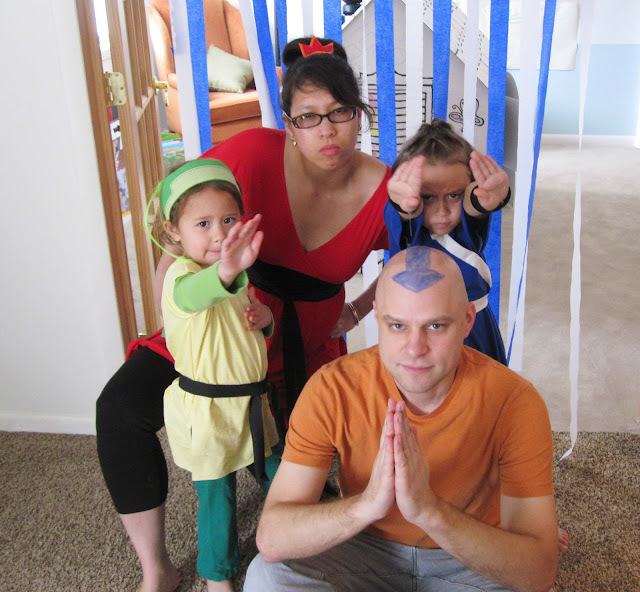 My son was Aang a couple years ago for Halloween and no one seemed to know who he was as we trick-or-treated. This is so awesome! Excellent work. What a wonderful honor one of your daughter’s favorite things. I’m sure she will look back at the pictures and smile at all the costumes and appreciate how hard you worked in making her day special. Thanks for sharing at Your Cozy Home Party! hehe LOVE it!!! You guys are too cute! Super cute … and I just love the action photos! This is amazing!! SO cute!! You are so much fun! What a great party idea and great pictures! Thanks for linking up. Hahaha – That is so adorable! She has some great waterbender moves! And that is a cute costume!! Thanks for showing this off at Romance on a Dime! We LOVE Avatar!!! What a great costume. You are awesome! Oooh, I LOVE Avatar! 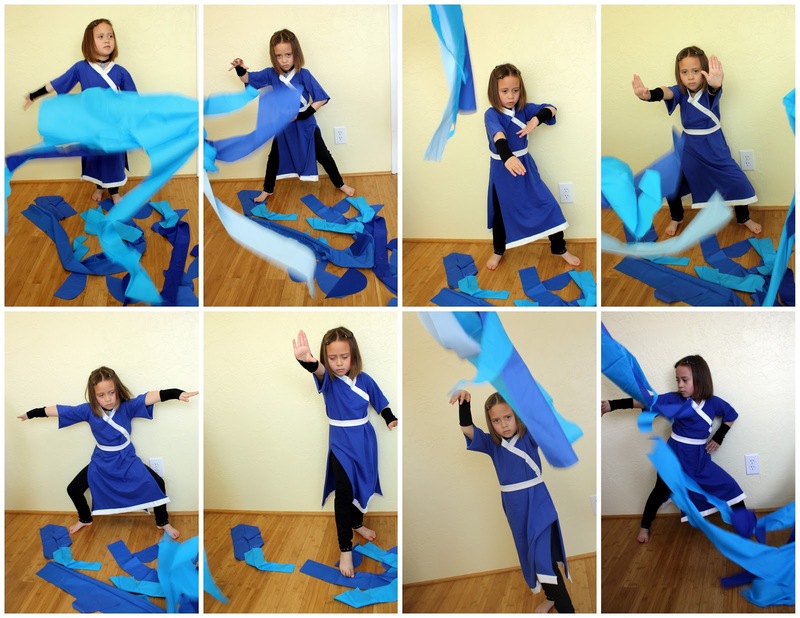 <3 Your little waterbender is adorable. You did a great job – way to go, Mom! – giving her free rein with her imagination! Thanks for linking up to Sassafras Salvation! T is such a cutie. Love all the waterbender action shots. And her uncle is one cool dude to help her enjoy her day!! Thanks for sharing at the Sunday Round UP. 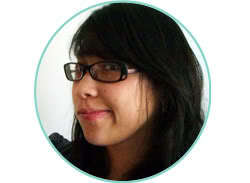 I love to see what you share on your great blog. How fun!! You did an amazing job!! Thanks for sharing at Sharing Saturday! !